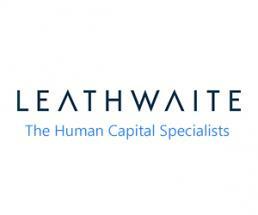 Leathwaite has been featured in the 2019 Sunday Times HSBC International Track 200 ranks Britain’s mid-market private companies with the fastest-growing international sales. Companies had to be registered in the UK and be independent, unquoted and ultimate holding companies. They are ranked according to the compound annual growth (CAGR) in their international sales over the latest two financial years. Total sales had to be at least £25m and international sales at least £1m in the latest financial year. Companies with sales of less than £25m are covered by our sister SME Export Track 100 league table. The research was carried out by Fast Track principally between August and December 2018. Data on international sales can be limited. Companies filing abbreviated accounts are not required to disclose any geographical breakdown of sales, while firms that file full accounts can choose to not disclose a geographical breakdown of sales if it is prejudicial to their interests. Fast Track would like to thank HSBC for its title sponsorship of International Track 200 for all 10 years; DHL Express for its sponsorship for a third year; and Oracle NetSuite for its first year as a main sponsor. 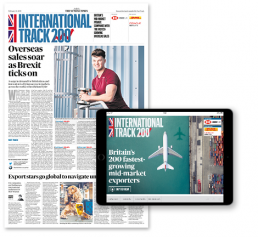 We would also like to thank our media partner The Sunday Times for their continued support of International Track 200 for all 10 years.